Menomale esistono i libri, mi vien da dire guardando il tempo che c’è fuori. In effetti, come sarebbe triste la vita se non ci fosse qualcuno che ti racconta, parola dopo parola, una storia. Carlos Ruiz Zafón. Se amate Barcellona e le sue strade assolate, ma in alcune ore un pò misteriose, questo è il vostro scrittore. Devo dire che mi ha conquistato sia dal punto di vista del contenuto che della forma. Misteri su misteri, storie fantastiche che ti tengono aggrappato al libro e non ti lasciano andare fino a che non hai letto l’ultima pagina. La forma è sostanzialmente semplice, ma è condita da metafore apprezzabili. Ti fanno entrare all’interno della storia più di quanto tu voglia. E si rimane cullati da una Barcellona antica ma ormai evoluta che non esiste più, e che viene raccontata attraverso storie sinistre quasi magiche, aspettando il momento in cui potremmo tornare, ancora una volta, a passeggiare per le sue strade -un tempo- (o adesso più che mai) maledette. God bless the books, It’s what I have to say looking at the weather outside. Life would be so sad without somebody telling you, word after word, a story. Carlos Ruiz Zafón. If you love Barcelona and the sunny, but sometimes a little mysterious, streets, this is your writer. He won my interest from the point of view of the content and the style. Mysteries after mysteries, fantastic stories keep you hold onto the book and won’t let you go until the last page has been read. The style is simple but is larded by very significant metaphors. They get you into the story more than you want to. We stayed rocked by an ancient Barcelona which is now evolved and it doesn’t exist anymore; it’s told through strange and almost magic stories, waiting for the moment we’ll come back one more time, walking in those streets -once- (or now more than ever) cursed. There’s no place like home. Which one? Sarà che quando l’ho visitata mi sembrava di essere in un sogno, ma vivrei volentieri a Casa Batllò. Mi ha affascinato da morire la sua filosofia, le linee sempre e comunque tonde, che sono ispirate dal tema del mare; sembra di essere su una spiaggia tridimensionale. La struttura e la faccia principale è fatta di motivi ossei zoomorfi, quasi fosse un fossile costruito sulla strada. Inizia il viaggio con una scala. La guida suggerisce di toccare e perfino accarezzare tutto ciò che incontri, solo così si può godere veramente di Casa Batllò. Un’ampio salone, maioliche che riflettono la luce e il più geniale caminetto che io abbia mai visto. Anch’esso tondo. E’ come un viaggio, un’esperienza. Affascinante. Num. 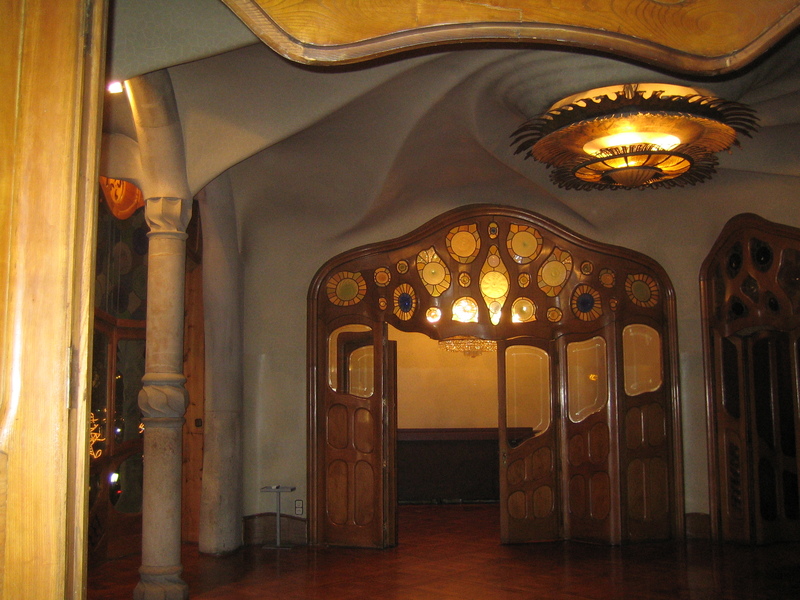 43 Passeig de Gràcia, casa Batllò, Antoni Gaudì. Barcelona. Maybe because when I saw it, I though I was in a dream, but I’d live with pleasure in Casa Batllò. I was bewitched by its philosophy: always curved lines, which are ispired by the sea theme; it looks like being in a three-dimentional beach. The structure and the main front of the house is made of zoomorphic bone motif, almost like a fossil built on the street. The journey begins with the stairs. 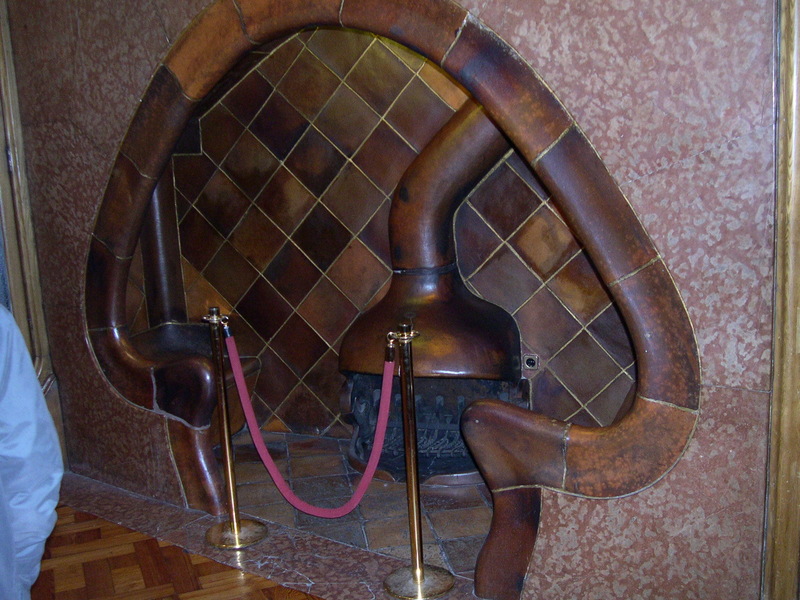 The guide suggests to touch and even caress everything you meet, this is the only way to really enjoy Casa Batllò. A spacious living room, majolica covering reflecting the day light and the most ingenious fireplace I’ve ever seen. Round that too. It’ s like a travel, an experience. Fascinating.